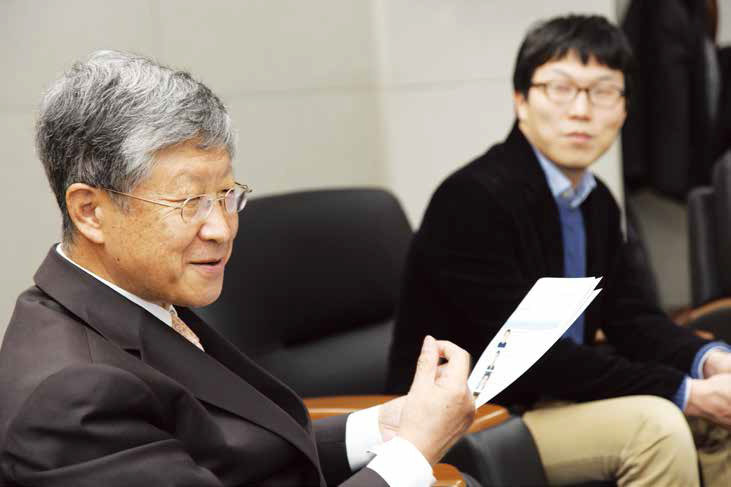 On 22th September, 2014, Doochul Kim, a professor emeritus at Seoul National University, took office as the second president of the Institute for Basic Science (IBS). As IBS prepares for its great leap forward , the new president and early-career scientists came together to address IBS’ issues and seek solutions. At the conversation between Doochul Kim, the new president, and emerging scientists held on December 4th, six young scientists shared their diverse opinions of the current situation and IBS’ new direction. The first issue addressed during the conversation was group leaders. The group leader system was one of the core structural components of IBS. However, disputes over the selection of group leaders continued since its inauguration. These disputes were due to the suspicion that group leaders were selected based more on academic or social networks rather than on the candidates’ competencies because they were appointed or recommended directly by IBS directors. This criticism, however, was somewhat unfair to IBS because it had prepared its own evaluation system in relation to the selection of group leaders. After all, IBS had decided to improve the group leader system. President Kim underlined that the problem of group leaders did not lie in the position but the roles and titles. Clearly, it is necessary to have people who can lead individual research projects; practically, however, it is difficult to revive the group leader system, which had already been converted to a different system. President Kim indicated that a separately designated title, whatever is given, would be sufficient because group leaders still have distinct roles to play even if their official titles disappeared. Citing his experience working at Fermilab as an example, Hyang Kyu Park (a research fellow at the Center for Underground Physics, HQ) also agreed to have another official title for a team leader. As a solution, the president proposed that each center to manage its personnel system and titling autonomously. President Kim was concerned, however, about whether such individual operations might cause an unnecessary administrative burden. Therefore, he added that IBS would support each center with administrative processes, such as creating regulations, while maintaining the rule of thumb that each center seeks solutions autonomously. The next topic discussed was the lack of space. Jaesung Kwak (a research fellow at the Center for Catalytic Hydrocarbon Functionalizations, KAIST ) emphasized the lack of space, which impedes the ability to conduct research, as being one of the problems that individual centers have been unable to address practically. As this issue had been continually raised internally at IBS, it drew the highest consensus from the conversation participants. Hyang Kyu Park underscored that the situation was even more serious in centers that housed much equipment. There was also the opinion that space could be used more efficiently by consolidating commonly used infrastructures as much as possible. Hyang Kyu Park said that he would offer the computing equipment currently used by the Center for Underground Physics if IBS creates a separate computer cluster for all of IBS researchers. The operating staff, however, presents a fundamentally more difficult problem than space. The point that Hyang Kyu Park made was consistent with this, in that newly acquired equipment is not fully used due to the shortage of professional staff. It was suggested that IBS should increase efforts to resolve this problem in particular as it is challenging to hire professional staff who canmanage computing equipment and also have an understanding of physics. It was also noted that IBS might need to collaborate with other research institutions while remaining cautious about the expansion of its personnel. According to President Kim, astrophysicists, including members of Korea Astronomy and Space Science Institute, often use the Supercomputer Center at the Korea Institute of Science and Technology Information (KISTI). President Kim stated that one should also seek ways to streamline IBS’ operations rather than expanding the organization, as the construction of a computer cluster had been planned. Along with the lack of space, career continuity was another important concern that was discussed. Jae Sung Woo (a group leader at the Center for RNA Research, Seoul National University) suggested that IBS should consider career management, as it allows IBS researchers to focus on their research. Jae Sung Woo said that he had given up a professorship to become an IBS research fellow because he believed that he would not be able to focus on his research due to lecture preparation and administrative responsibilities, even though the professor position would be more stable. Jae Sung Woo still believed that he had made the right decision, but emphasized that there should be more appealing components to attract excellent researchers. Byunghee An (a research fellow at the Center for Geometry and Physics, POSTECH) also said that job stability is an important factor for researchers when choosing IBS for their careers. Currently, at the Center for Geometry and Physics, nearly half the research fellows list IBS as their first post-degree employer. However, they remain uncertain about their careers. Byunghee An noted that the tenure system is not a solution to this problem because some of the conditions and regulations are unclear, although the system supposedly guarantees a position for a certain period. In this regard, Seok Hyun Bae, a head of the Research Support Team, confirmed that the five-year tenure is guaranteed and that he would revise details such as contract renewal before the end of the tenure period. President Kim also agreed that job stability has a great impact on attracting overseas researchers, and therefore, that he would amend related issues in a reasonable manner. Communication among researchers was also cited as another area for improvement. All the participants agreed on the necessity of designing a vehicle that could facilitate interactions and collaborations among researchers who work in different fields, as this is important in contemporary science technology research. President Kim agreed that a communal space is necessary, but emphasized that it should not result in an unnecessary burden. “It is not desirable to direct interactions from the top because this might increase unnecessary administrative work. It may be necessary to form official meetings to some degree, but casual meetings voluntarily organized by researchers should come first. I will actively support efforts of young researchers in their 30s and 40s with strong intellectual curiosities to coordinate interactive meetings.” Hyang Kyu Park proposed that efforts to seek joint research, beyond exchanging ideas, would be also useful. “I believe that we can achieve good results if we seek research opportunities in collaboration with researchers in other fields. The research facility at the Center for Underground Physics, where I belong, is located deep underground. 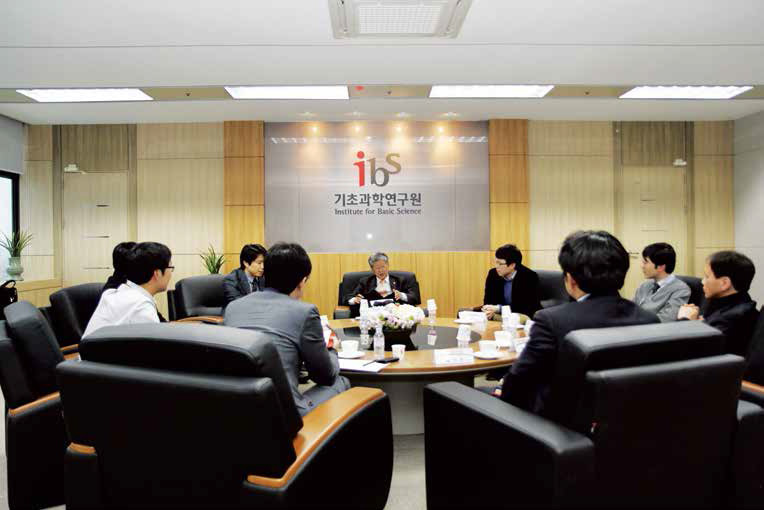 While supporting President Kim’s direction, the research fellows asked him to maintain the existing IBS policies, despite outside criticisms or demands. There was also the belief that IBS should be more active in internal and external public relations. Noting that IBS could not operate a well-designed system due to public criticism, Sang-Gyu Kim emphasized that IBS should correct its shortcomings by accepting public opinions, but should actively highlight its strengths in order to attract outstanding talent. Three years since its inauguration, IBS has become the centerpiece of Korea’s basic science. However, there is still much room for improvement. Whether it will become the Korean alternative to the Max Planck Institute or remain as one of many research institutions will depend on future endeavors. In concluding the conversation, President Kim assured those attending that he would try to develop IBS as an ideal basic science research institution based on its uniqueness. Many stories were shared during the conversation. President Kim and the participating researchers agreed, however, that the most critical task is to create an environment that attracts researchers and allows them to be fully committed to their research.